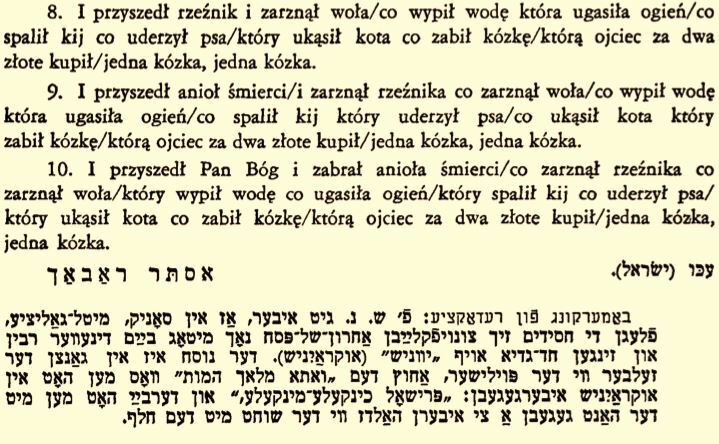 This entry was posted on March 24, 2015 at 8:00 am and is filed under Main Collection with tags Austria-Hungary, Bukovina, chad gadya, Galicia, Itzik Gottesman, Lifshe Schachter Widman, Mordkhe Schaechter, passover, peysakh, Poland, Polish, Ukraine, Zvinyetchke. You can follow any responses to this entry through the RSS 2.0 feed. You can leave a response, or trackback from your own site. There are a lot of versions of this songs left in polish folk music. sung either by children or by adults for fun. will be happy to discuss this isssue!